Handmade textiles are personal, no matter where in the world they're created, and these photos and explanations of 25 diverse world cultures' techniques vividly share the details. Take a voyage through these pages and see how today's artisans continue to create traditional fiber arts with age-old methods. 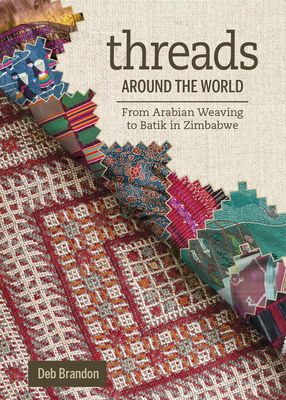 Blending well-researched information, engaging style, and inspiration, the pages explore espadrilles, flatwoven rugs, mittens, voudou flags, mirror embroidery, and the histories they hold. This open-eyed approach will appeal to textile devotees, from the casually curious to professional artists, and to people who are interested in heritage crafts and diverse cultures. Brandon has written for more than a decade for WARP (Weave A Real Peace), anonprofit networking organization whose members are dedicated toimproving the quality of life of textile artisans in communities inneed. Deb Brandon is a respected textile artist and enthusiast, a writer, and a speaker. She is a professor in the Department of Mathematical Sciences at Carnegie Mellon University, and is also a member of WARP (Weave A Real Peace).